Questions not answered below may be directed to info@goldstarwives.org. 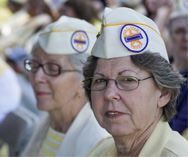 What is Gold Star Wives of America? Gold Star Wives is a Congressionally Chartered non-profit service organization. The charter was granted because GSW is unique in that it is the only service organization capable of providing services to the active duty and service-connected military surviving spouses. To qualify for membership your spouse must have died while serving on active duty in the Armed Forces or from their service connected disability as a result of that service. What is the cost of Membership Dues? Membership dues are $35 per year. The dues year begins January 1 through December 31. New members paying dues after July 1 receive the remainder of the calendar year plus the entire following year membership under their first $35 payment. Membership is extended to anyone whose spouse died while serving on active duty, or of a service-connected cause. Remarriage does not bar membership. When are the National Newsletters mailed? There are 4 newsletters a year, mailed the first week of December, March, June, and September. They are mailed at non-profit bulk rates, which means that it could take up to 3 weeks to be delivered. Members may select to have their newsletters emailed as a cost savings to GSW. How do I contact Veterans Affairs to answer my questions? You may dial 1-800-827-1000 and this will automatically connect you to your VA Regional Office. How do I obtain a WWII-type service flag? A banner with one gold star is available at $6.95 + tax (in some states) + shipping from American Legion Emblem Sales, 1-888-453-4466, M-F 8 a.m. to 6 p.m. eastern time. How do I reach CHAMPVA, TRICARE, or Meds by Mail to have questions answered? ChampvVA is also available for those who have remarried and were at least age 55 when they remarried. Is my DIC payment affected when I receive Social Security? DIC stands for Dependency and Indemnity Compensation, which is awarded to spouses of active duty, or service connected surviving spouses. There is NO SOCIAL SECURITY OFFSET for DIC. This offset was eliminated in 2004. SBP is Survivor Benefit Plan. This usually only affects retirees and is a plan paid into by the retiree so her/his spouse will have benefits after the retiree dies. If the death of the retiree is additionally caused by a service connection the surviving spouse would also be entitled to Dependent Indemnity Compensation (DIC). The SBP is offset by the amount of DIC received (Currently $1215 a month). DIC is non-taxable and SBP and SSIA are. COLA = Cost of Living Adjustment. For 2014 it will be a 1.5% increase on DIC and allowances paid by the VA. The SBP Cola will be 1%. The Special Survivor Indemnity allowance is increased by a yearly schedule and not affected by COLA, this allowance is currently set to expire in 2016.